This entry is a total scroll-a-thon. No, I’m not sorry. You should see how much I edited out. It began with an email from Andrea at a garden of nna mmoy, in which she revealed that my WHOYCBE Spoilee was KLee of Reluctant Prophet. I had not read KLee’s blog before, but I quickly hopped over to read the questionnaire. I learned a lot. And then, I still had no idea what I was going to do for her. See, Andrea is crafty and most of the people whose comments I’ve read on her craft entries are crafty, and those names looked to me an awful lot like the list of Spoilee names. To top it off KLee is crafty and I am, well, I am not. I can bake. That’s about it. I dedicated myself to reading all of the Reluctant Prophet archives and scouring the blog for details. Some themes emerged: a love of holidays (particularly Christmas), reading, crafting (many varieties of), penguins, and baking; a love of teaching, her family (of course), and the color royal blue. The holidays are a busy time of year, what with the end of my semester and the steep increase in work at my mom’s store, so I often find myself stretched thin come the middle of December with grading and helping out at the shop. Fortunately, I do my best thinking while immersed in white noise, like road noise or, say, the noise of the sewing machines at my mom’s embroidery shop. EMBROIDERY SHOP?! OMG, I could SEW her something! Genius! Crap. She lives in the south. /sigh. What could I sew? I went snooping around in the archives, looking for posts about baking, to see if she really is a cooker/baker, and I found a post from Thanksgiving weekend, in which she describes the process of decorating for Christmas. Ah, I know. I could sew some Christmas towels. I wouldn’t have to know what color her kitchen is because with a Christmas or snowy picture on it, it would hopefully fall outside the ironclad color coordination rules of home decorating because it would fall under the easy-going, festive rules of holiday decorating. Meh. It was what I had to go on. The quest for towels began. I personally own lots of off-white kitchen towels, and I hate how they always show everything and I don’t care to bleach things if I don’t have to, so white and cream were out. Besides, if I picked a darkly colored towel, something like snowflakes would show up. But what color? Oh. Of course. Royal blue. Do you know how freaking hard it is to find royal blue anything? Let alone towels? I can’t even remember how many stores I looked at before I found some beautiful bright royal kitchen towels at Meijer. Along the journey to find them, I also decided that the gift should have some kind of unifying theme. 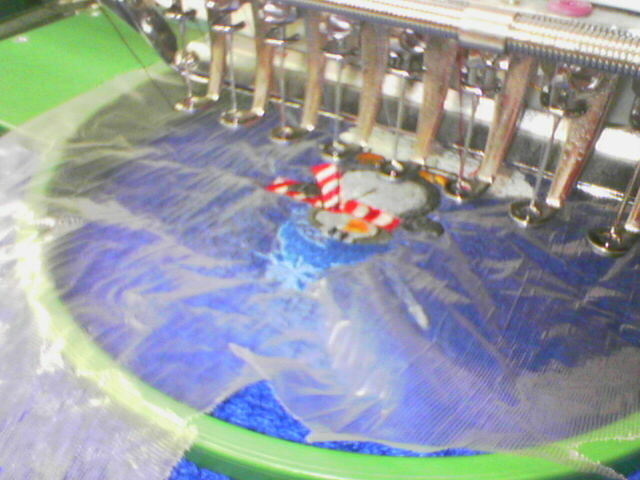 I chose penguins, ergo when I found the towels, I sewed penguins on them. 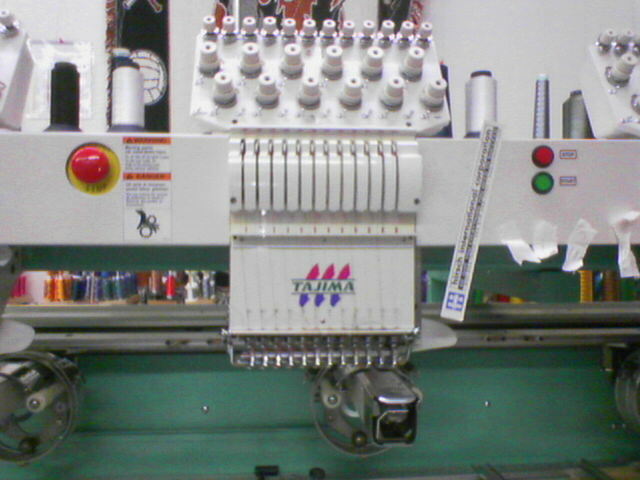 Here are some shots of the towels coming together. Pardon the quality of the in-process ones, taken with my econo-camera phone. penguin, 70% sewn. 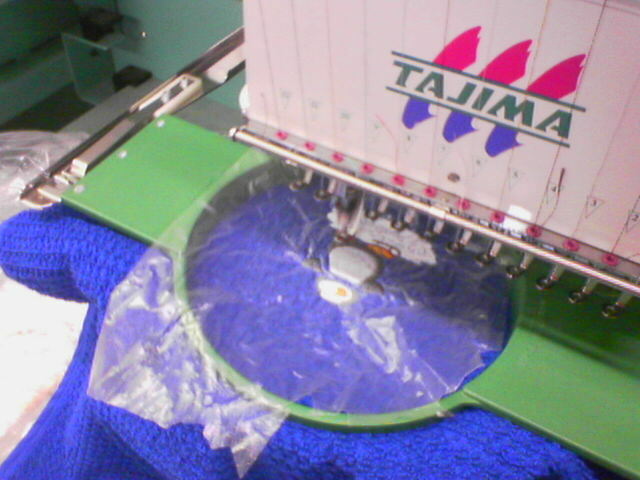 the plastic stuff is water-soluble and keeps the towel loops from sticking through the embroidery. penguin, nearly done. i’d like to say i purposefully chose a dark pewter thread for the penguin in order to make it look more like a fuzzy, juvenile penguin, but really, i didn’t realize when the book called for “charcoal”, it meant “nearly black.” sheesh. 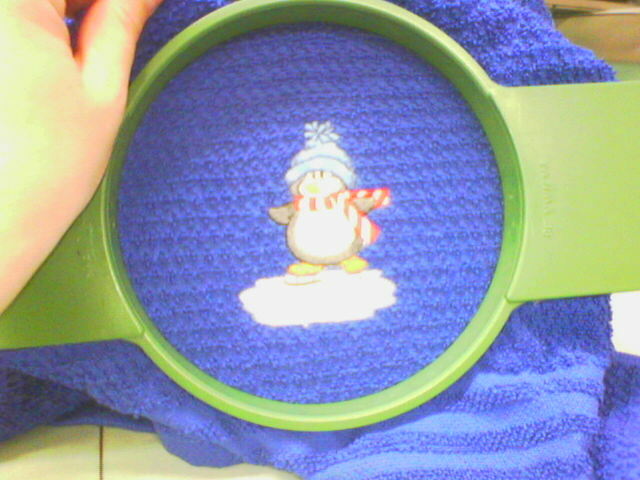 penguin, still in the hoop, but finished, with plastic peeled. With the towels done, I turned my attention to gathering the other gifts (to be shown a bit later) and then to making the cookies. But there was a little problem of the $25 limit. By the time I got to making the cookies, I had hit the limit, which meant the cookies had to be made from ingredients existing in my cupboard. Because I had depleted my stores making holiday cookies before Christmas, only one cookie could emerge from my pantry: Oatmeal Scotchies. As with nearly all cookie baking projects in this house, the Oatmeal Scotchie Event began with me making Chocolate Peanut Butter No-Bake Cookies. This is a proactive attempt at keeping Husband Guy happy and/or off my case, for God’s sake I’m making cookies here, will you quit bitching that there’s no chocolate in what I’m making? Please. Now, stand back already. no-bakes in the background. not pictured, cinnamon and baking soda. Then it occurred to me that it was Saturday afternoon. Saturday, December 30th, to be exact, and the post office was closed for the day, and for Sunday and Monday for the New Year. And, crap. Tuesday, too, for President Ford (may he rest in peace). So the cookies that I made were going to sit around until Wednesday for me to mail them. I was already kind of disappointed in them. They spread a lot and a number of them caramelized (read: burnt) on the edges and were probably thereby rendered unsendable. I decided to eat a couple in order to boost my blood sugar while I pondered what to do. Ultimately, I didn’t make any decision about the cookies until Tuesday, as I wrapped up the gifts. I also chose a penguin pin for its whimsy and royal blue sled. I just hope KLee is a pin person. It didn’t occur to me until after I sent the gift that she works with small children who might use it as a weapon. I hope they don’t. Because I’ve done my time at English teacher conferences, I always have a pile of goodies lying around, suitable for teachers, so I decided to share. Attention: This cost me no money. I am openly acknowledging these things were already in my possession, thus they are are regift. * I chose the sticky notepad because of a post from last year (can’t find it now) wherein KLee was distressed at the loss of all of her post-it pads after a spill on her desk. I added the cd because it is of children’s poems being read. I included the radish seeds because growing stuff with wee tots like those in her classroom is fun and cool. I selected a bookmark that reads “Those who can do. Those who do it better teach” because it’s totally true. Dammit. The truly risky inclusion in this gift pack are the stamps I found. I ‘m not really sure if KLee does stamping regularly, but I think it’s at least something she enjoys after seeing the picture of the candles she made for people this past Christmas. very solid, hefty stamps. i was happy to find them, especially mr. penguin in his wee little hat. two stamps, two towels, a pin, a pile of teacher stuff. Then it was time to package up the Scotchies. “Ugh. It’s chewy already. It’ll never keep until the 10th. Drat.” Start over. yes, my counter is clean. not pictured, self-restraint in buying alcohol. The upshot is that KLee ended up with a LOT more cookies. And since I beat the flour a little longer and used parchment paper, they didn’t spread or burn. Very tasty. this is a gallon-size ziptop bag. So, come Wednesday morning, I packaged the whole caboodle up and sent it to the south, with love. may it reach you safely, KLee. may you enjoy it all and may the cookies still taste good. *KLee, I do hope you’re not offended by the inclusion of this stuff. It’s absolutely fine with me if you regift items. Honestly. Except the cookies. Unless they’re gross. I thought the towels were adorable, but purchased! To know that you MADE them, they’re freaking awesome! (And I’m Blindbeard the pirate, so I hadn’t even noticed the “Season’s Greetings.” I’m blind *and* unobservant!) I really do love them. They’re the absolute PERFECT color, though I’m sorry you had to go on a quest to find them. (And I would have been delighted with a scarf or blanket — while it’s warm here most of the year, we DO get cold weather, and I LOVE snuggling with a warm blankie.) And the “theme” of my kitchen is disorganization, so there’s no particular one color that goes with that. So the blue is great. But, I put them in the bathroom, because my husband tends to burn the holy hell out of kitchen towels, and they’re safer there. I wouldn’t want my sweet little penguins to get roasted. Yes, I do wear pins — it’s almost embarrassing how many little holiday pins I have. I have Christmas ones, fall ones, Valentine’s Day ones…but my favorites are the penguins. See — you did perfectly! The kids don’t tend to mess my my jewelry, so have no fear on that account. The stamps were great! I do a lot of stamping, in fact, I’m actually a Stampin’ Up demonstrator, though I just started a few months ago. So, your gamble on the stamps was right on the money. I love the penguin, of course, and the candy one will come in very handy for Christmas card making. I’m not at all offeneded by the freebies — I put some in my gift to my spoilee, and you were very good to remember that I cannot function without sticky notes. I will use the radish seeds in class, and will probably find lots of good material on the poetry CD. Don’t fret about their inclusion at all! They were icing on the already wonderful cake. Thank you so much! I have already added you to my links so I can read you without fear of punishment from Andrea! I hope your gift comes soon, and I can’t wait to see your opening post! If I get you next year, will you make me some of those yummy cookies? Beautiful job, Amy. What a lovely package. And I’m so sorry you don’t have yours yet! I might have to do some detective work…. KLee, I’m so glad you liked everything, especially the cookies. 😀 They probably didn’t stay true to your questionnaire, but sometimes a surprise is nice. Thanks for the sweet Thank You card – I’m sure HG would grimace to know what effect this recent exposure to handmade cards (thanks, Andrea, too!) is probably going to have. Yikes! Andrea, Thanks! And anything you can find out would be great. I’ll email you to find out what you’ve learned, if anything. ccw, I will gladly share the recipe and I’ll happily make more for anyone who wants some. suze, I was actually surprised at how seemlessly the gift came together, even though I was sweating it at the start. Maybe it was just some good karma or plain ol’ good luck. Whatever! I’ll take it! I say: Cookies must contain either chocolate, peanut butter, oats, nuts, and preferably a combination of all of them…. the more, the better… or it’s just sick and wrong… This is why no-bakes are the closest to heaven an atheist can be….